You never know when you need to take on an "old lady" persona. Why, there might be a quilting convention in town, and you really want to go but they have a strict dress code. Or Maybe you're a big bad wolf trying to fool Little Red Riding Hood into thinking you're her grandmother. 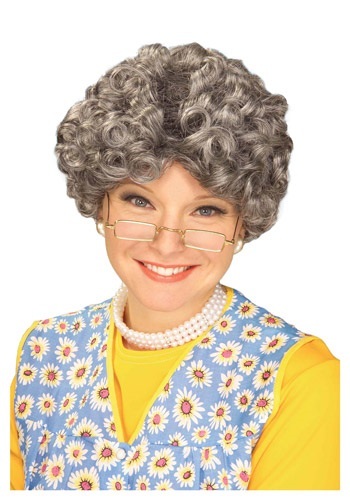 And heck, sometimes you just want to dress up as one of the Golden Girls, especially Sophia Petrillo. That's something we can all relate to. Whatever your reason -- and there are many -- this Yo Momma Wig will help you transform into a vision of grandmotherly goodness! As you can see, this awesome wig goes perfectly with a wide variety of different styles, costumes, and characters. Whatever you might have in mind, this wig makes the perfect finishing touch. And if you're starting your costume with the wig, be sure to have a look around at our selection of old lady costumes!